HIGHFIELD SOCIAL CLUB has a a spacious Function Room which is available for MEMBERS to hire for Private Parties, Wedding Receptions etc which can comfortably seat up to 200 people. 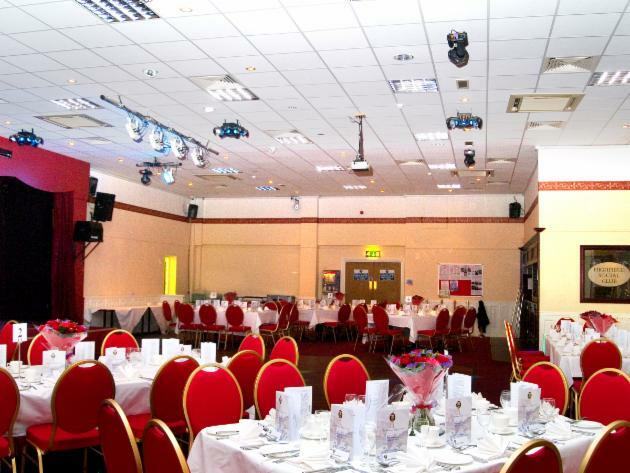 The HIGHFIELD SOCIAL CLUB Function Room has proved to be an ideal venue for Wedding Receptions, Birthday Parties, Anniversaries, Christening Parties, Corporate Functions, Office Parties, Fundraising & Charity Events, Sports Presentation Evenings, Celebratory Dinners & the like. The room is spacious with a high ceiling & can seat up to 200 people. The Club retains the room for at least one Saturday or Friday evening per month for club functions & the hall is used for Bingo on Tuesdays & Sundays, Bridge Club & Swissball on Monday and Wednesday. The Function Room is available for hire at all other times. All applications must be made on the appropriate form which can be downloaded below. All details must be completed in full & the application will then go to the Committee for approval. Please note that the hall is only available to hire by members & the committee does not consider childrens parties or 18th & 21st Birthday parties except in very exceptional circumstances. On confirmation of booking, a £100 deposit is required, which will apply in the event of cancellation. The actual rate of Hire is now based on the Bar Takings at your function, should the takings exceed £1000, the £100 deposit will be refunded in full, should the takings fall between £500-£1000, £50 (50%) of the deposit will be refunded, but if the takings are below £500 the deposit will be forfeited. These rates are based on assumed timings of 7pm to midnight, should the bar be required outside these times, additional charges may apply. These rates will apply to all Private Functions from 1st January 2014. Hire of the Function Room includes use of the kitchen regardless of whether it is used or not. Please note that use of the kitchen is limited to use of the work surfaces, fridges, ovens, & micro-wave oven only. It does NOT include use of deep fat fryers, crockery, plates, cutlery etc. The area of hire provided is limited to the function room, kitchen & stage only, the cellars & back of house areas are out of bounds. Any arrangements for catering are a private arrangement between the hirer & the caterer & do not form any part of the contract between the club & the hirer. Hire of the Function Room does NOT include the DJ booth, or Club Lighting & Sound Systems. Should you have a band booked, the use of the dressing room will be at the discretion of the management committee. Please note that the Highfield are only hiring you the facility, we are not staging the event for you & the club has no obligation to provide any facility not specifically described in the contract. The club can recommend the use of Electrolite Roadshow for your disco provision, please call Ken Wilson on 07885 229333. Access to prepare for your event must be arranged in advance, please bear in mind that the room does need to be cleaned before use & under normal circumstances will NOT be available until 11.30am weekdays & Saturdays, & 12 noon on Sundays. Please ensure you read your contract carefully to ensure you fully understand the terms & condition of hire. Please note that the Function Room can only be hired by a club member & the hiring member must be in attendance for the duration of the event & take full responsibility for the behaviour of the guests at the Function. Check availability from lists in foyer.